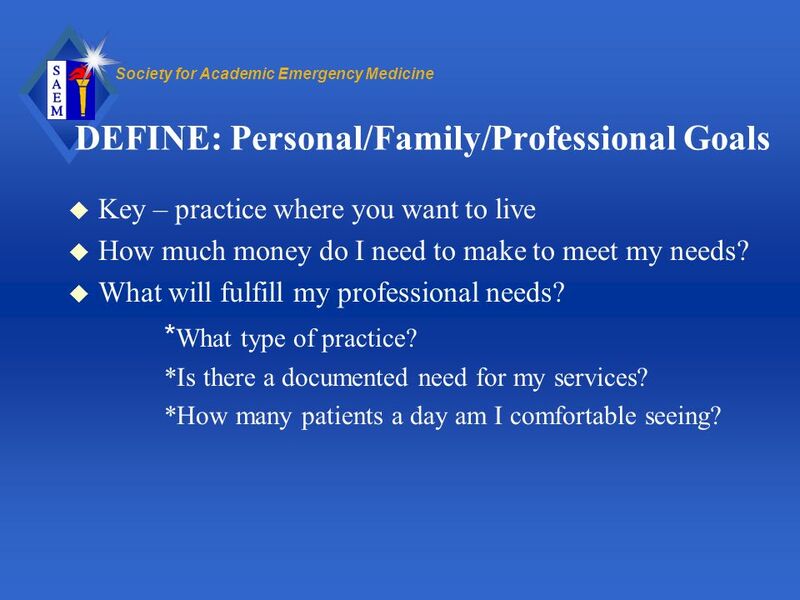 Key – practice where you want to live How much money do I need to make to meet my needs? 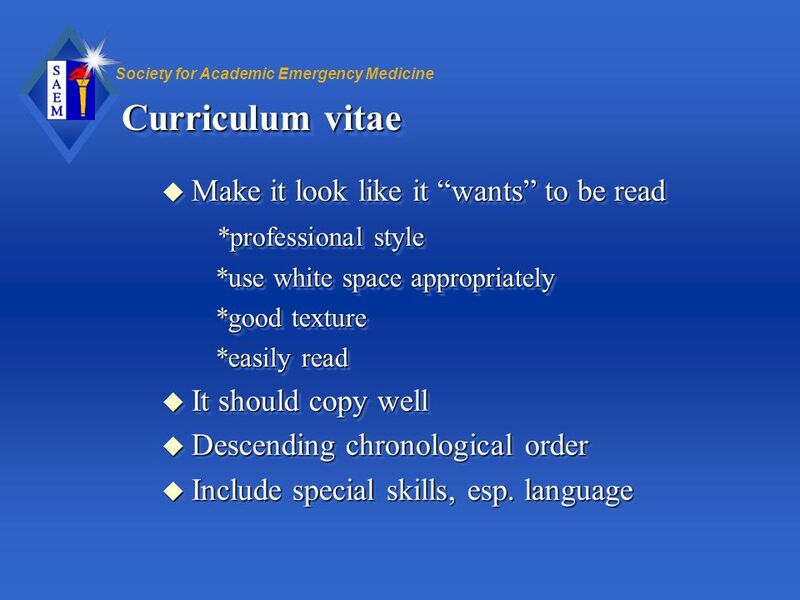 What will fulfill my professional needs? 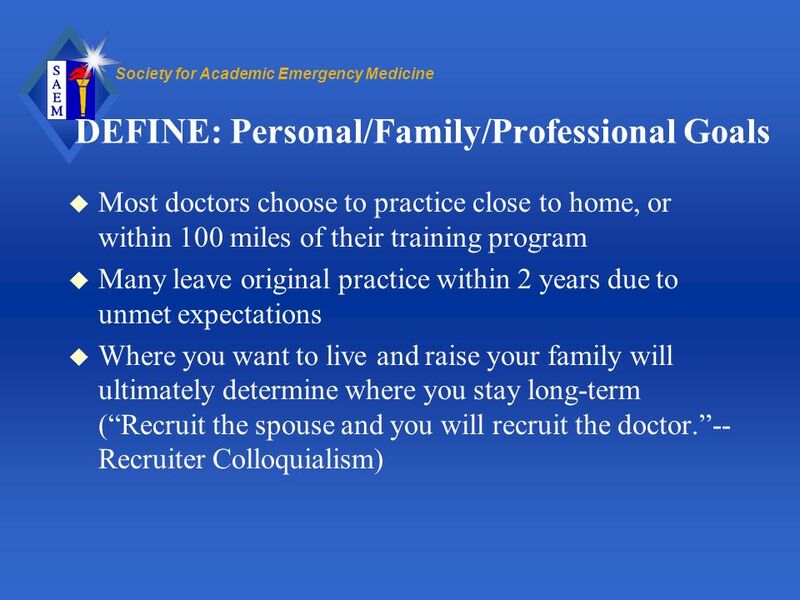 *What type of practice? 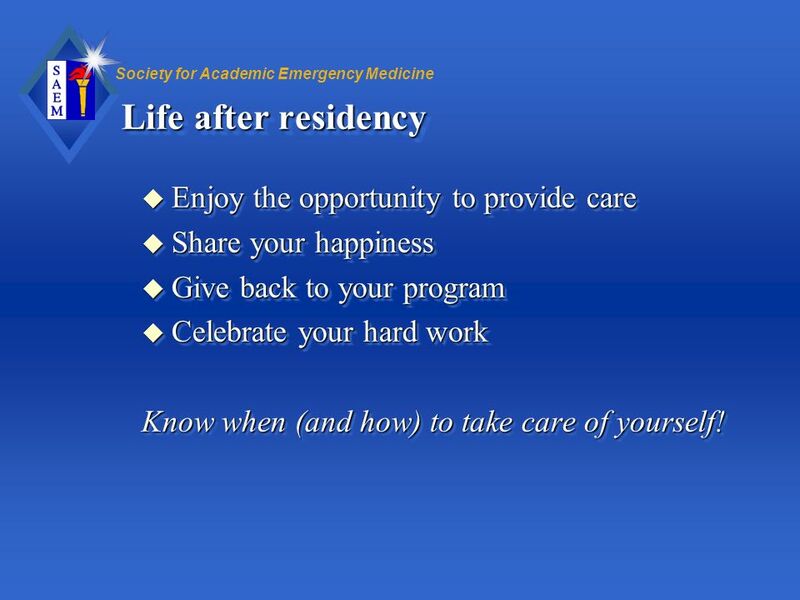 *Is there a documented need for my services? 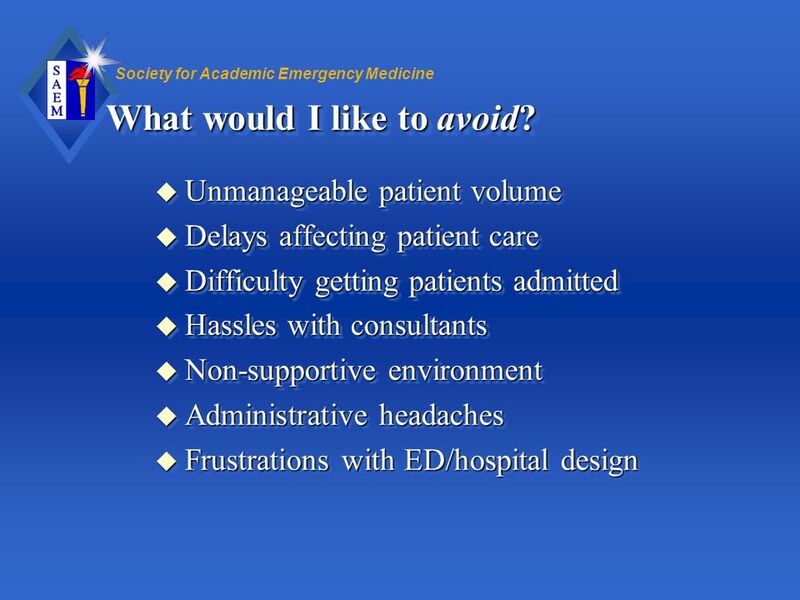 *How many patients a day am I comfortable seeing? 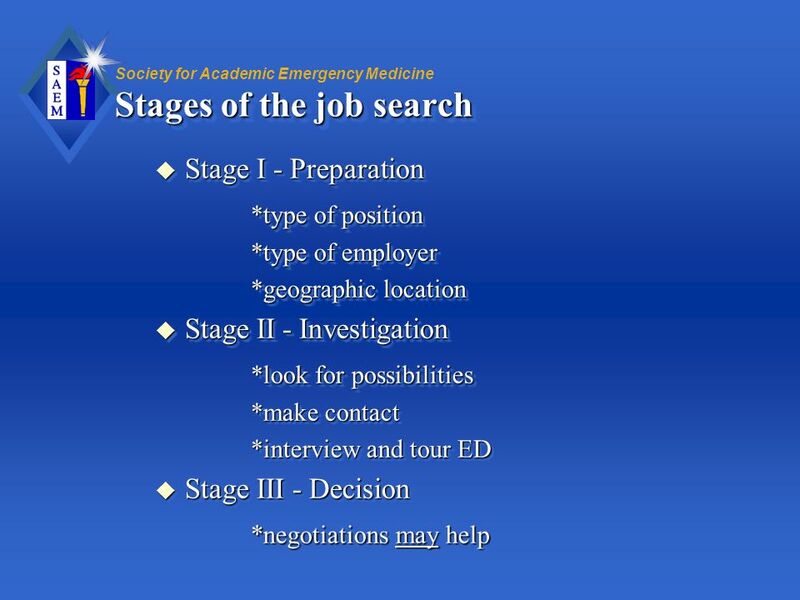 Stage I - Preparation *type of position *type of employer *geographic location Stage II - Investigation *look for possibilities *make contact *interview and tour ED Stage III - Decision *negotiations may help Contact : first by phone, then with CV and CL (and mention the phone conversation). 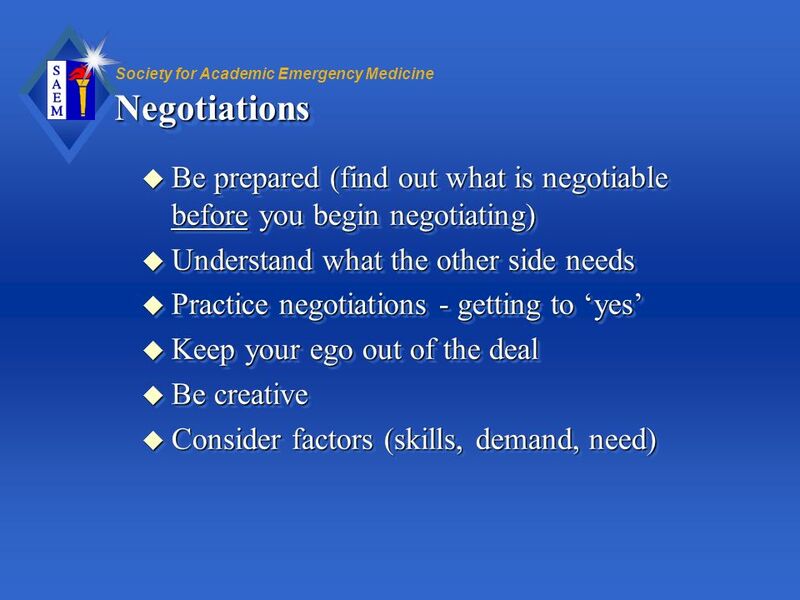 Negotiations MAY help, implies that the job must be something you want, negotiations are not going to make a bad job a great job. 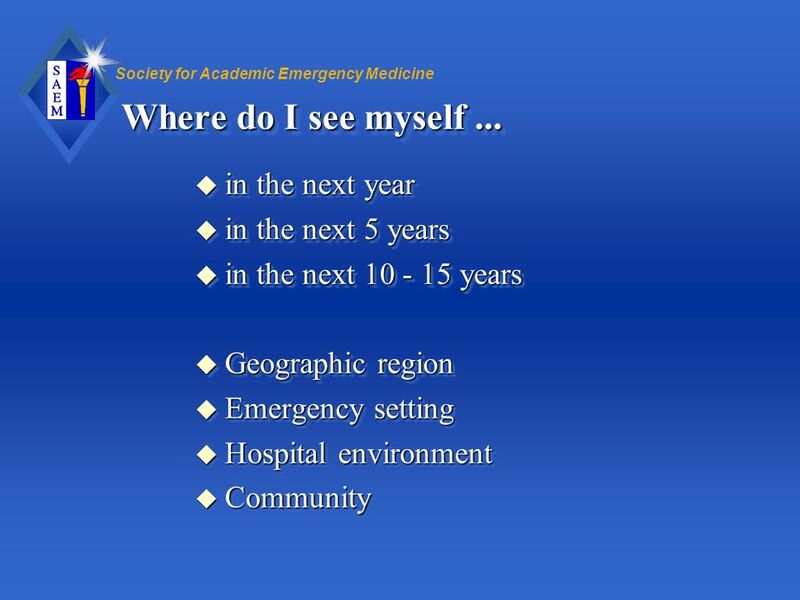 Geographic region Emergency setting Hospital environment Community Greg Henry, MD once mentioned at a conference we both presented at on Career Planning that some people spend more time planning their next vacation than they spend planning their careers. Let’s face it - region is important to most of you. 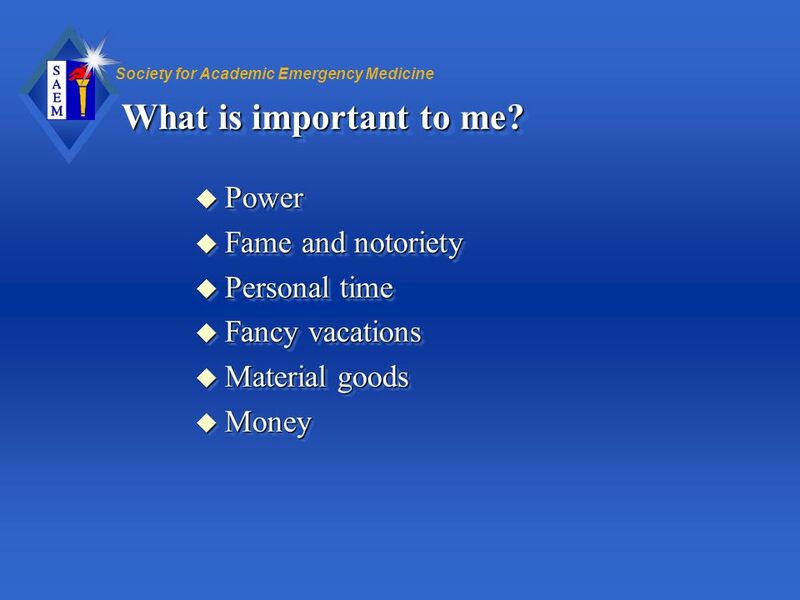 14 What is really important? 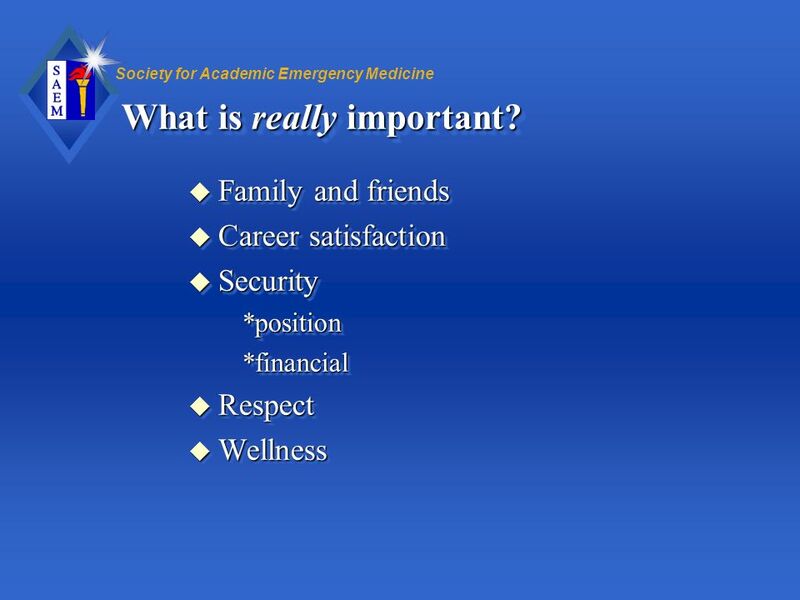 Family and friends Career satisfaction Security *position *financial Respect Wellness Wellness - means health, well-being, and peace of mind. This is a philosophical notion. It may be hard to imagine right now, since everyone in this room is probably working harder and getting paid less than they would like. Well, get used to getting paid less than you would like, and working harder than you would like too! 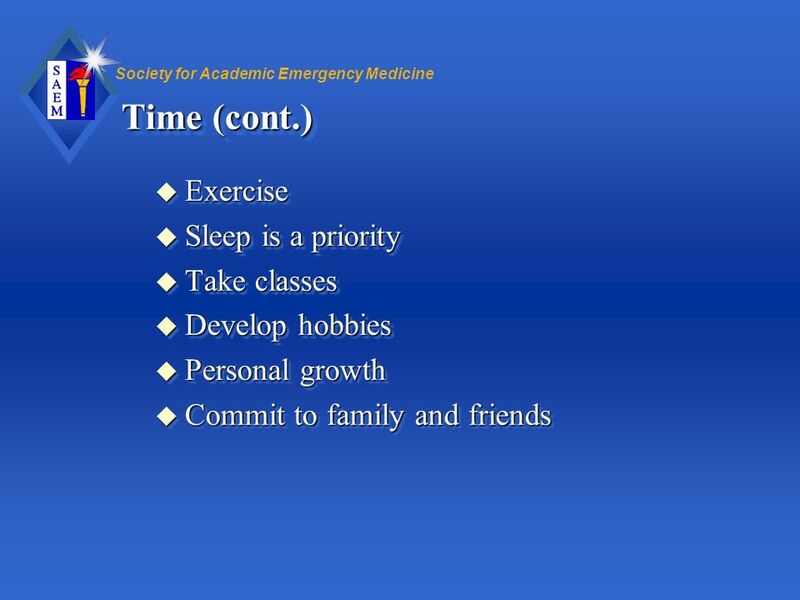 That’s why number of hours/week isn’t really on this list. 15 What do I enjoy when I am at work? 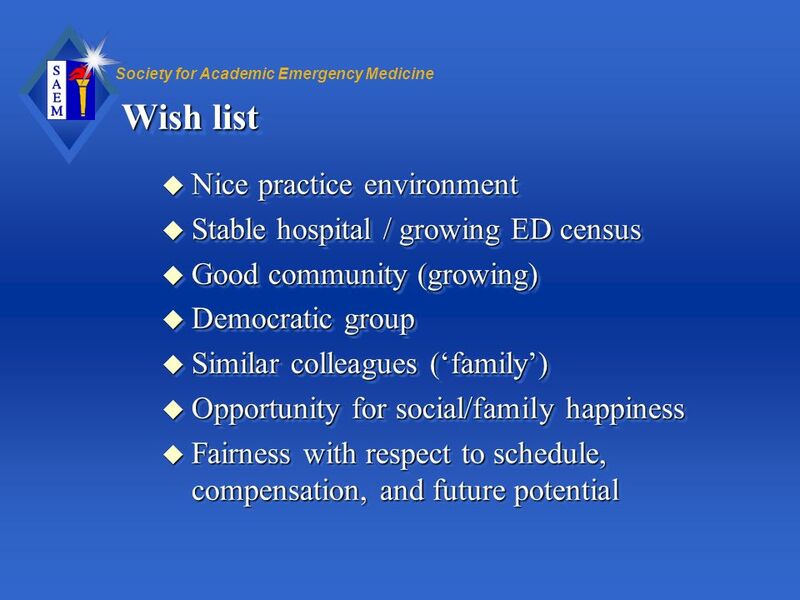 Nice patients Supportive staff Functional facilities Challenging cases Teaching Camaraderie This list will differ for everyone in this room, even those at the same program or hospital. Comaraderie - this may mean “double-coverage” to converse with another person (not to have them review xrays or help you). 17 What would I like to avoid? 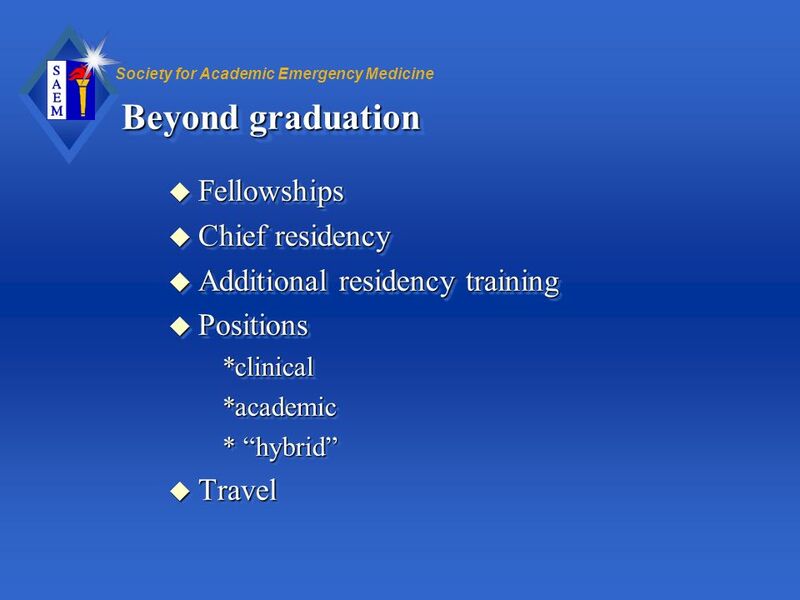 VA Military This includes Urgent care, fast track opportunities, but most EM graduates aren’t looking for these type of opportunities. 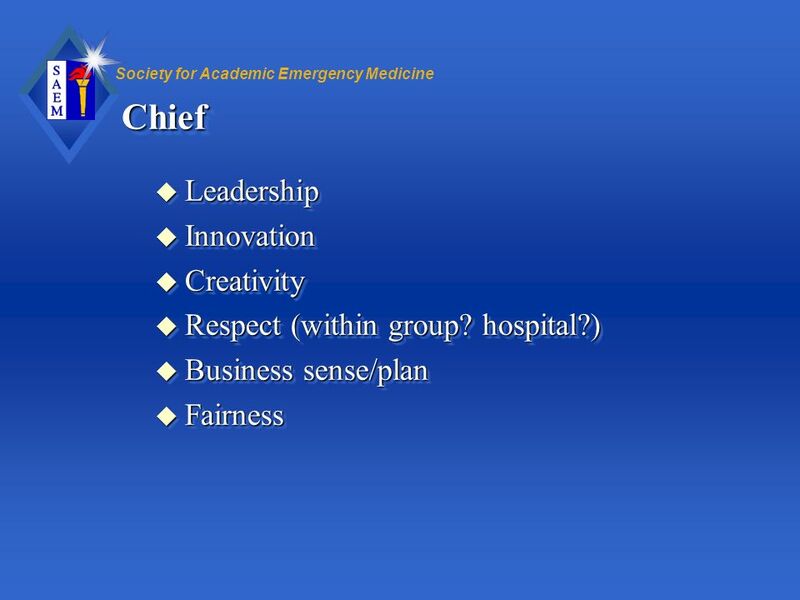 *leadership *research *community Why is the position open? How long? Most recent hire? Departure? Why? 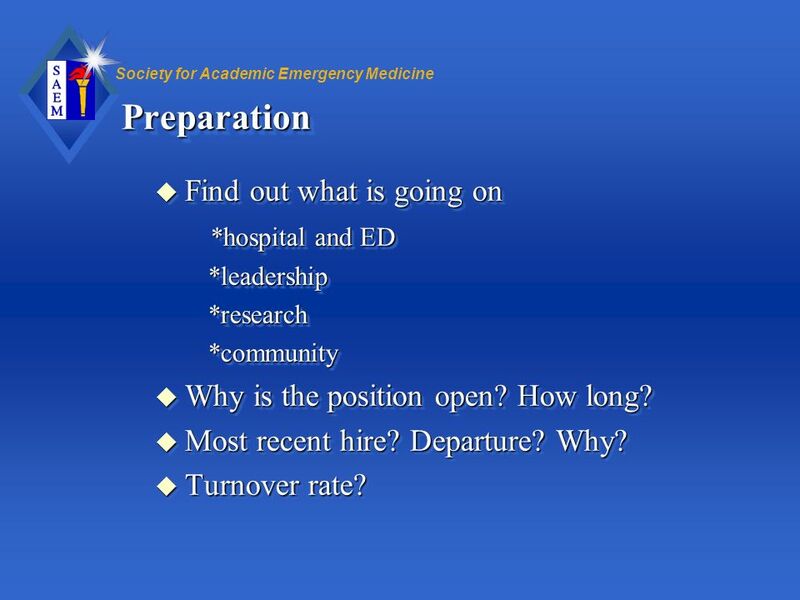 Turnover rate? 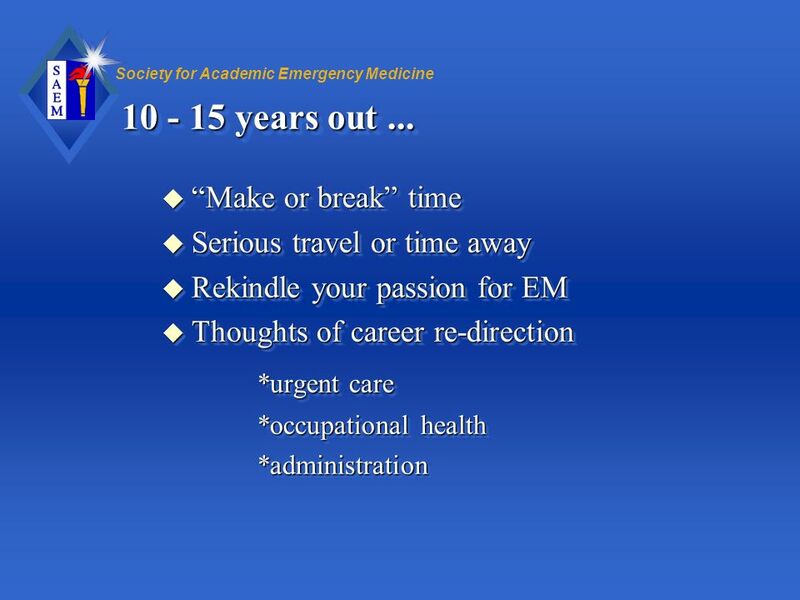 Years experience in EM? Exclusive? Background? Previous employment? 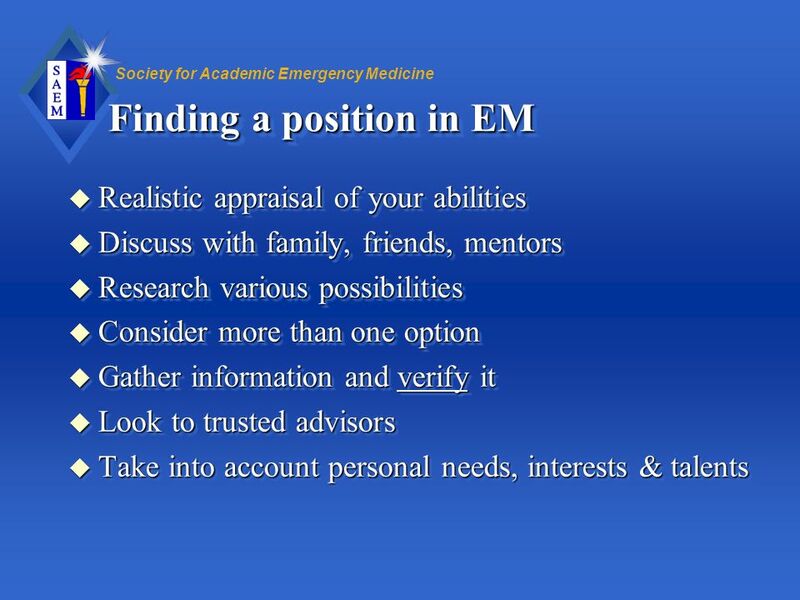 Knowledge of EM? Geographic region? 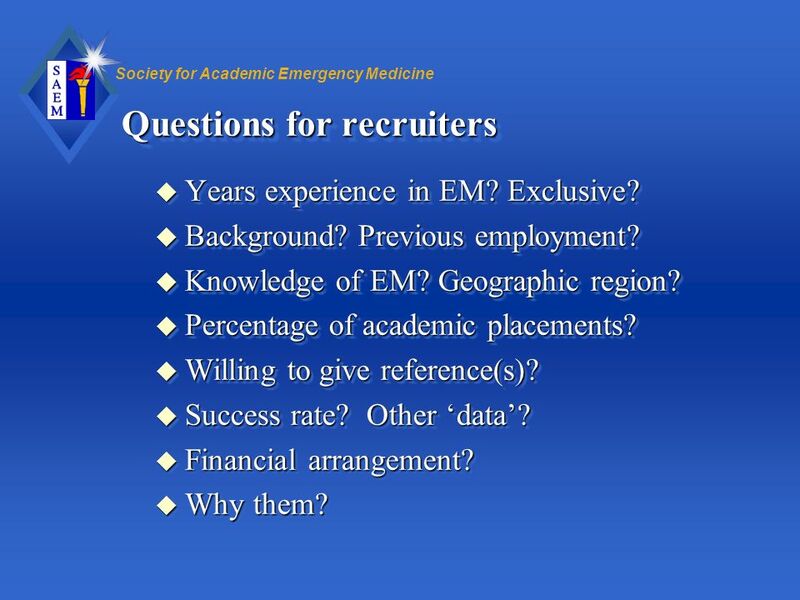 Percentage of academic placements? Willing to give reference(s)? Success rate? Other ‘data’? Financial arrangement? Why them? 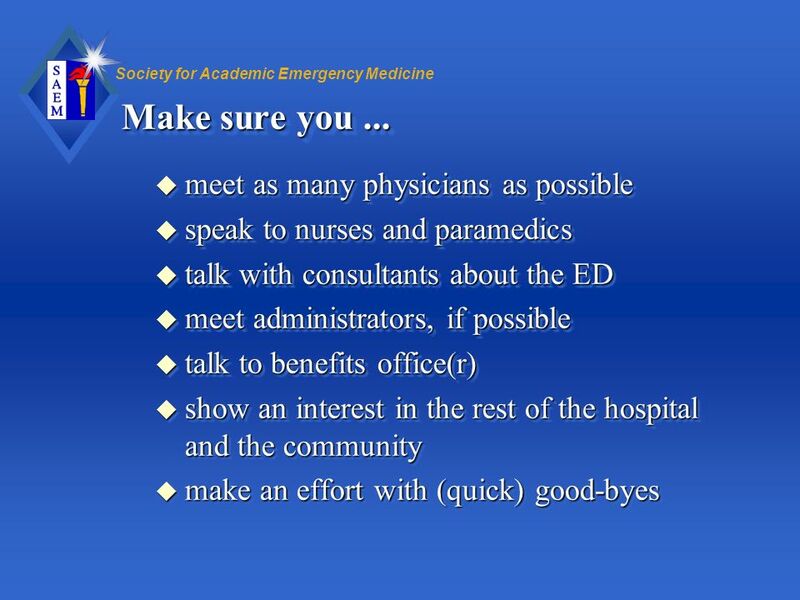 Have they seen the ED? Do they “know” the players? 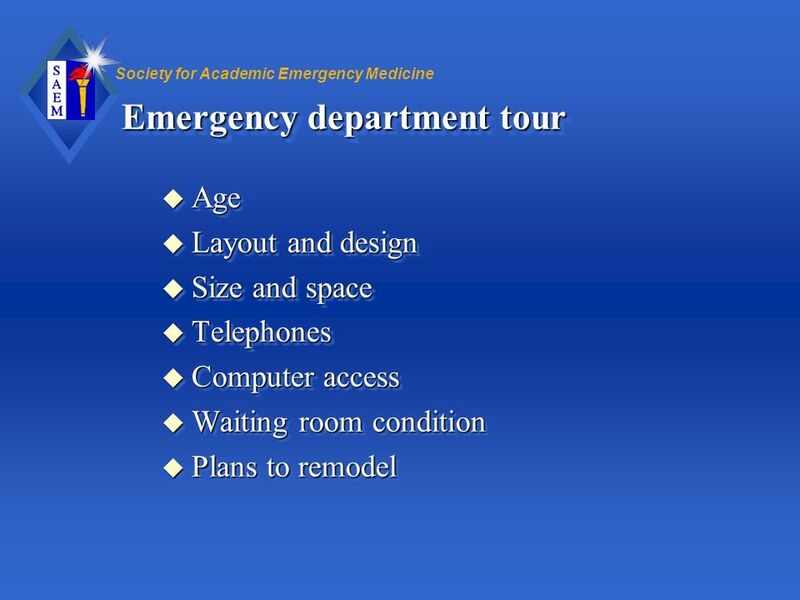 Have they placed anyone at that ED? Group? 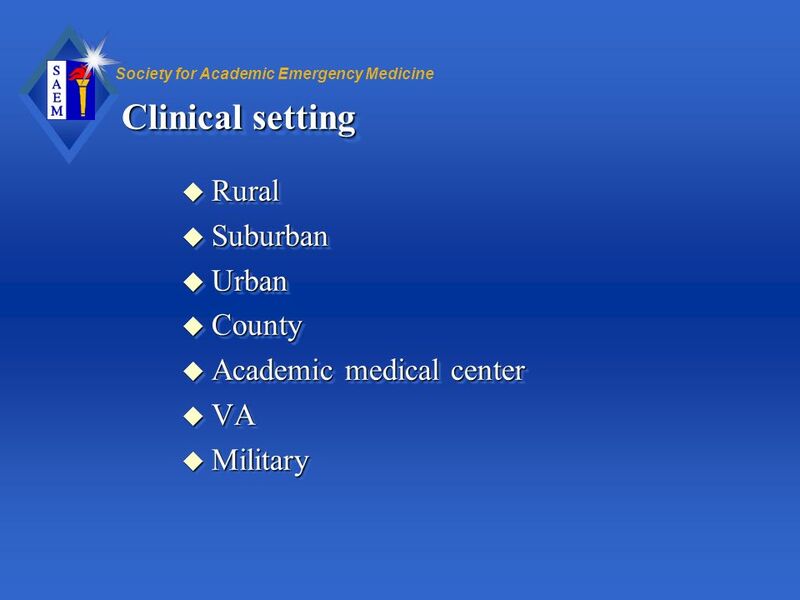 Area? Hospital? Numbers of people last year? Presently? 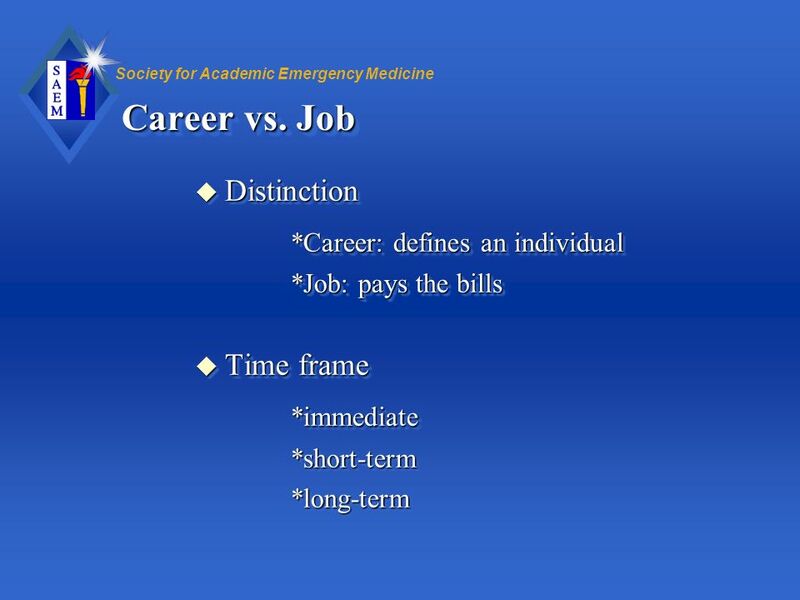 Background - paramedic? Patient? 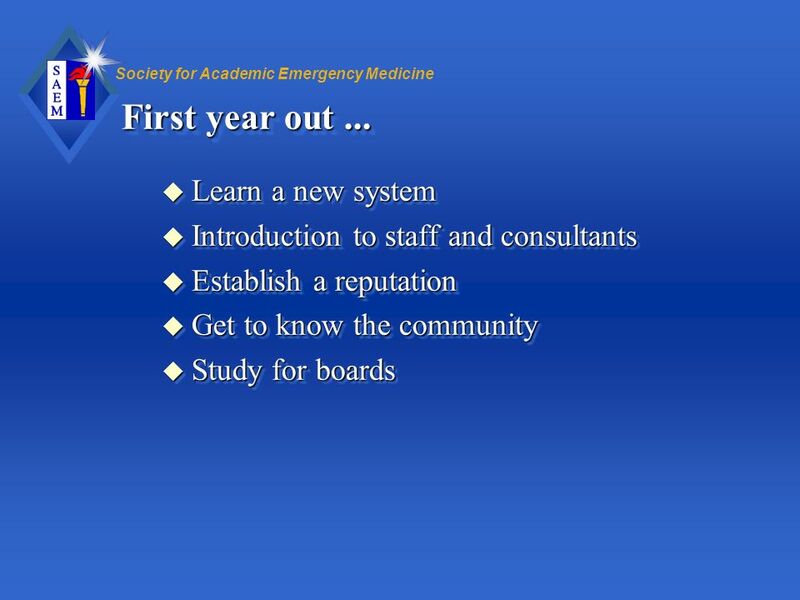 What resources they recommend (this gets at their ability to help)? 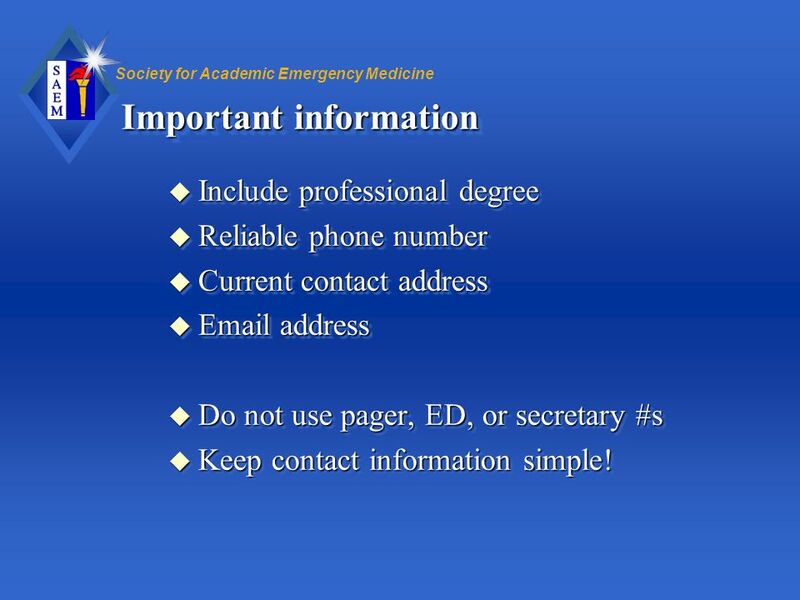 Include professional degree Reliable phone number Current contact address address Do not use pager, ED, or secretary #s Keep contact information simple! 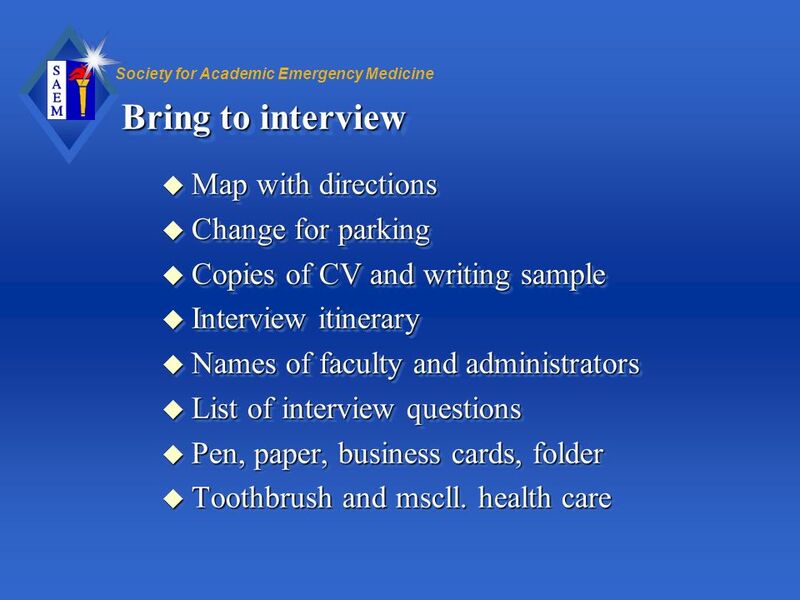 36 Interview questions Which questions? 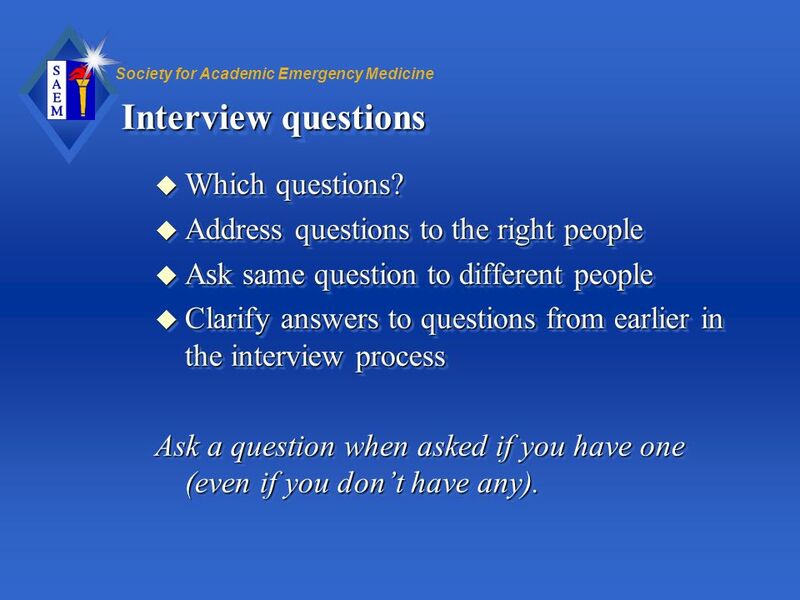 Address questions to the right people Ask same question to different people Clarify answers to questions from earlier in the interview process Ask a question when asked if you have one (even if you don’t have any). 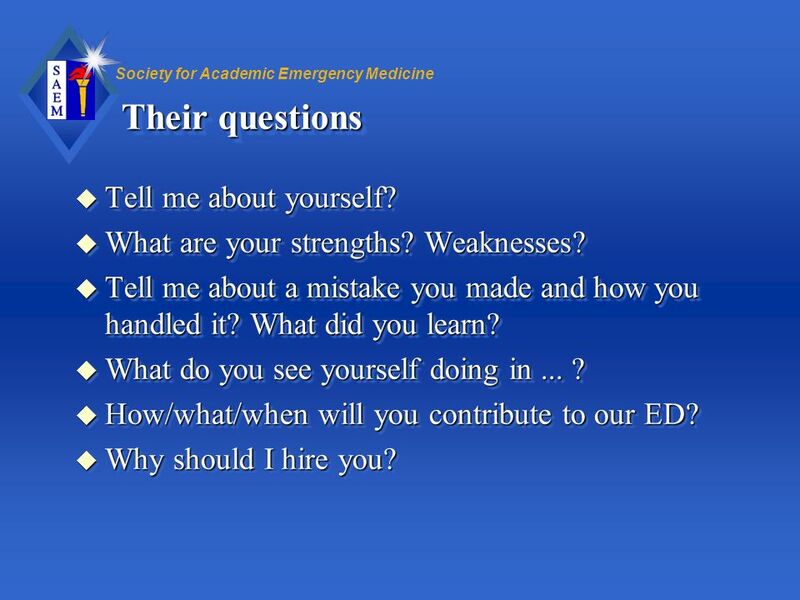 37 Their questions Tell me about yourself? 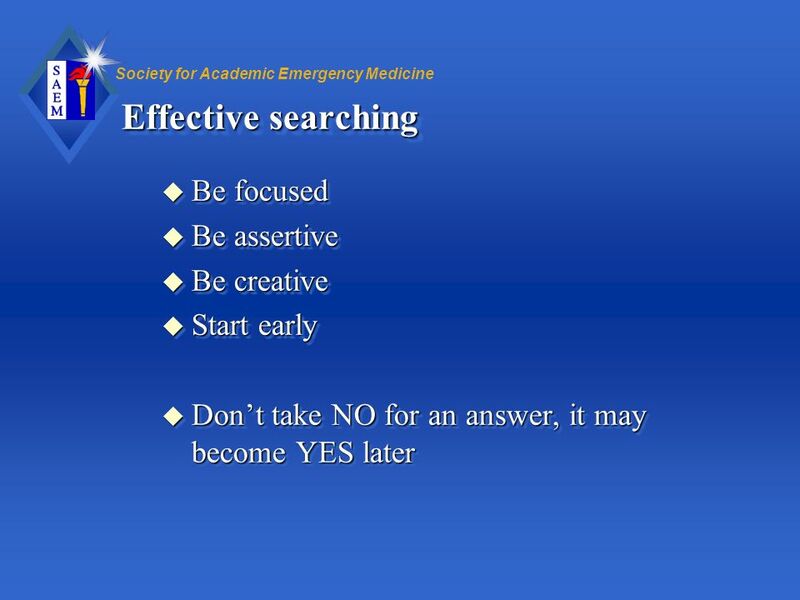 What are your strengths? Weaknesses? Tell me about a mistake you made and how you handled it? What did you learn? What do you see yourself doing in ... ? 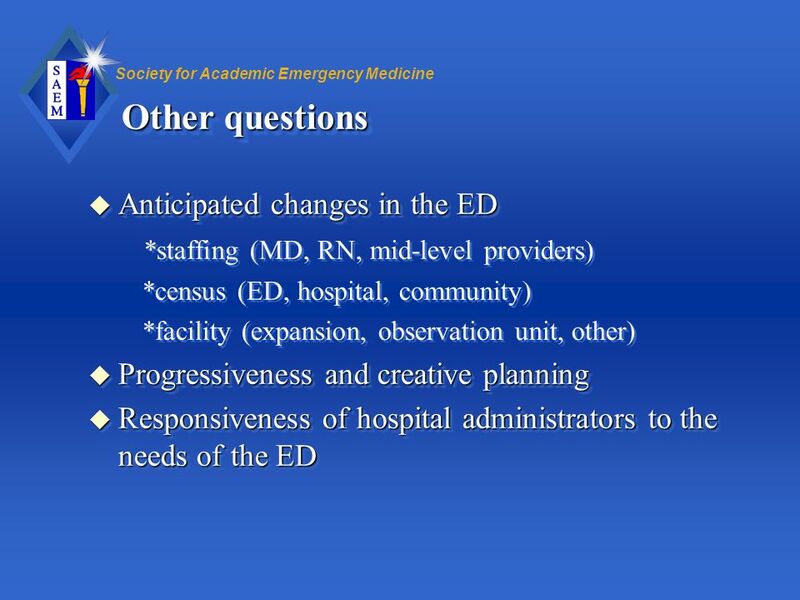 How/what/when will you contribute to our ED? Why should I hire you? Special projects - example How / What / When = how soon? 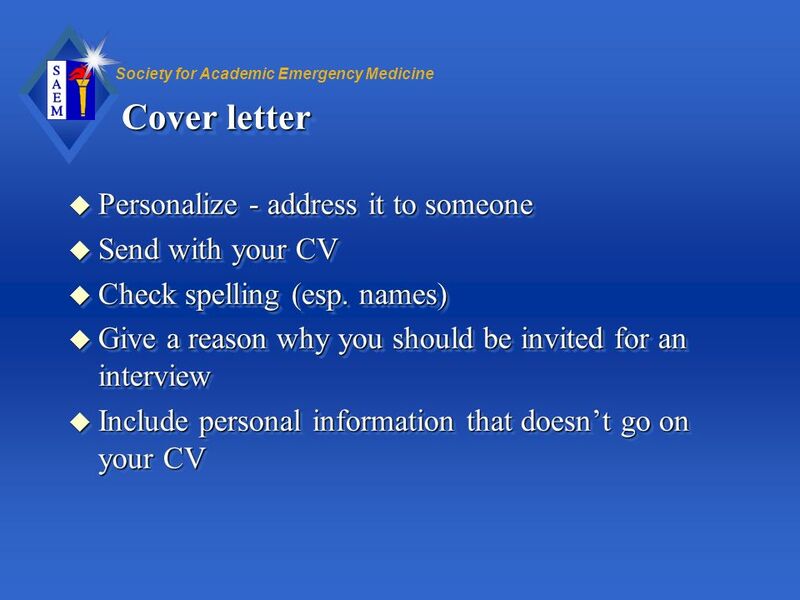 My favorite - “why should I hire you?” opens the door to impress them, tell them whatever you want. 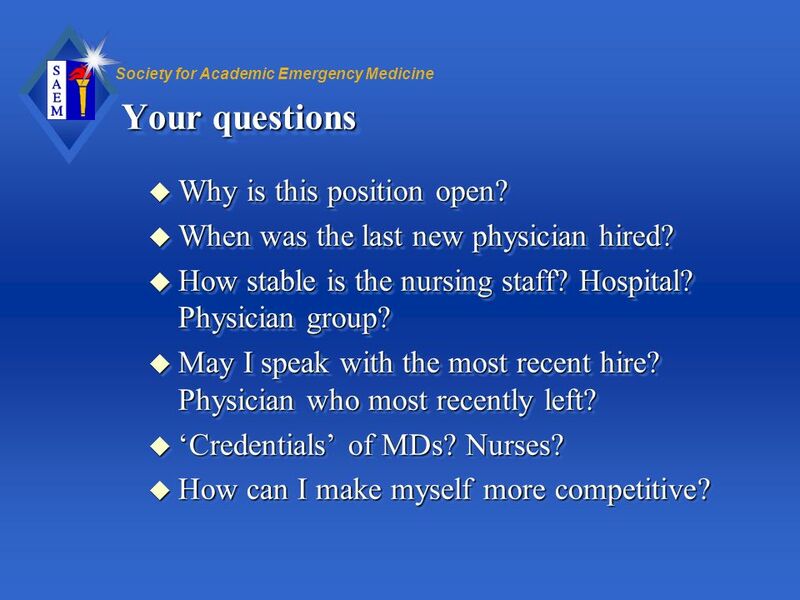 Instead of fearing this question, you should all HOPE that you get asked this question. 38 Your questions Why is this position open? 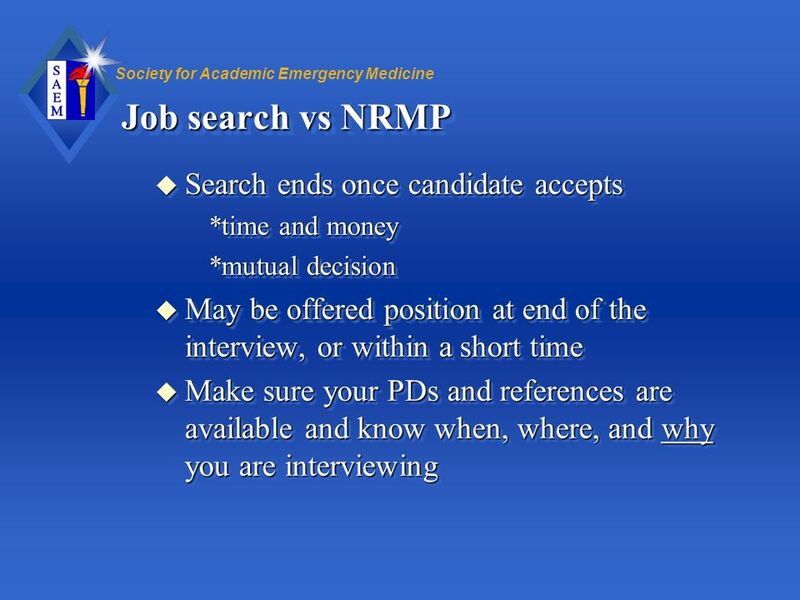 When was the last new physician hired? 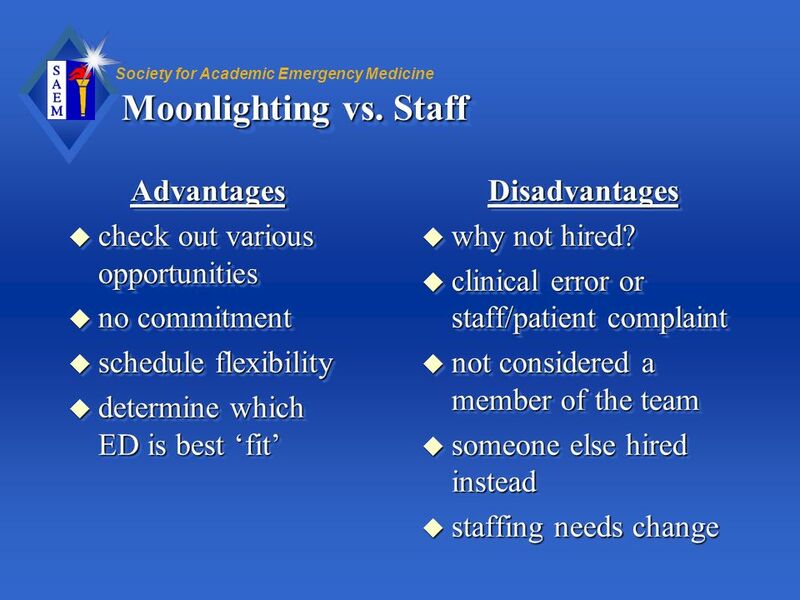 How stable is the nursing staff? Hospital? 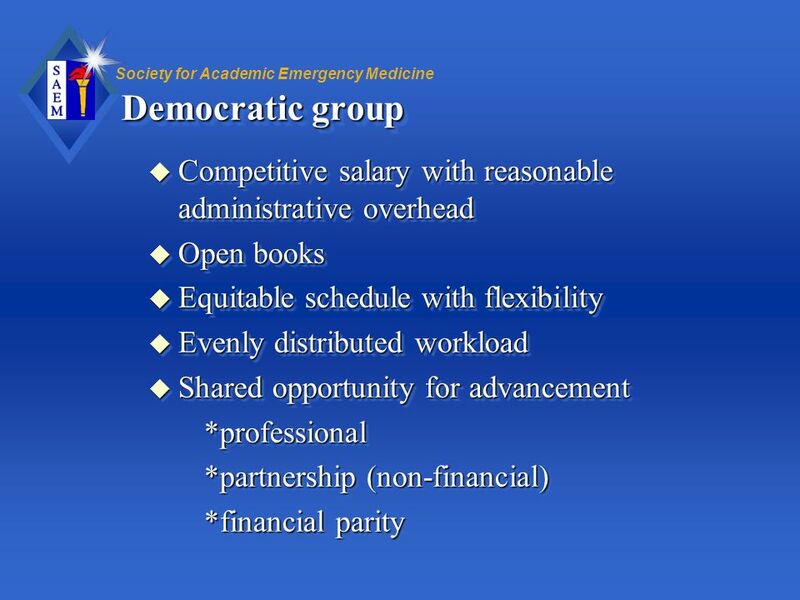 Physician group? May I speak with the most recent hire? 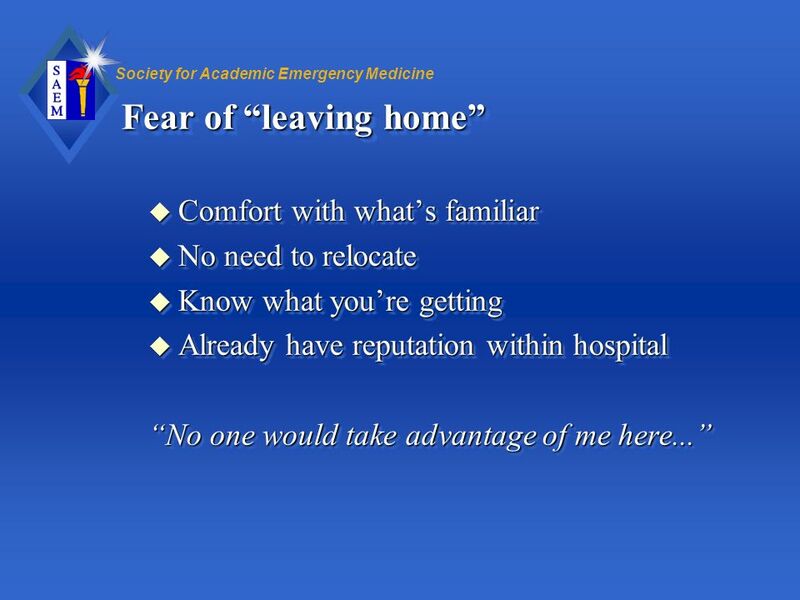 Physician who most recently left? 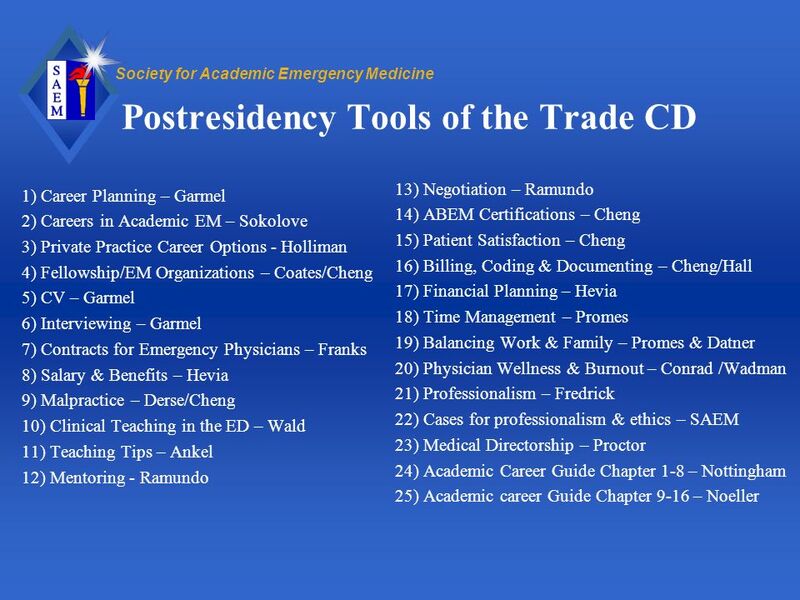 ‘Credentials’ of MDs? Nurses? How can I make myself more competitive? 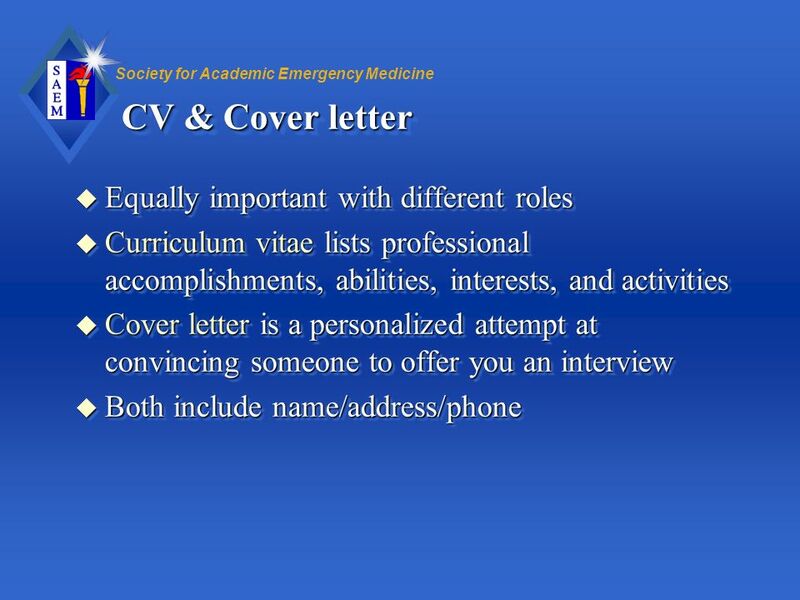 What are you looking for in a candidate? 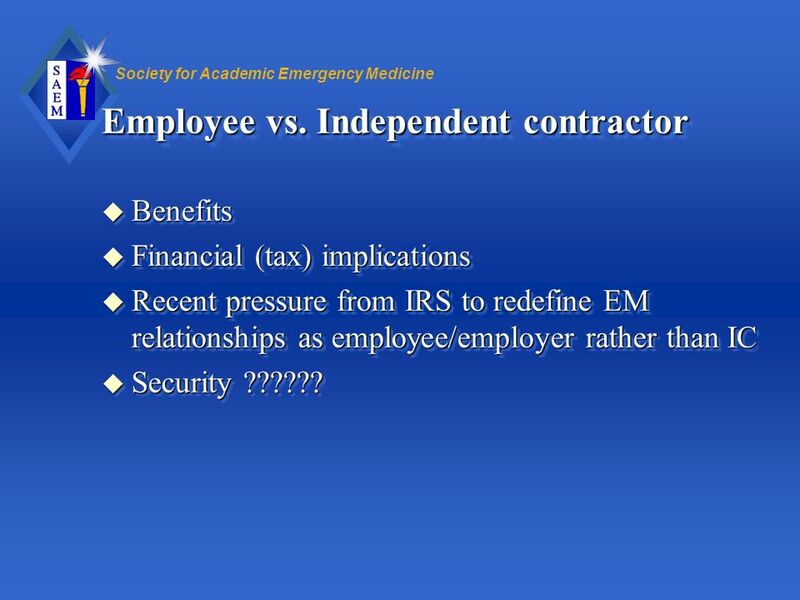 Benefits Financial (tax) implications Recent pressure from IRS to redefine EM relationships as employee/employer rather than IC Security ?????? 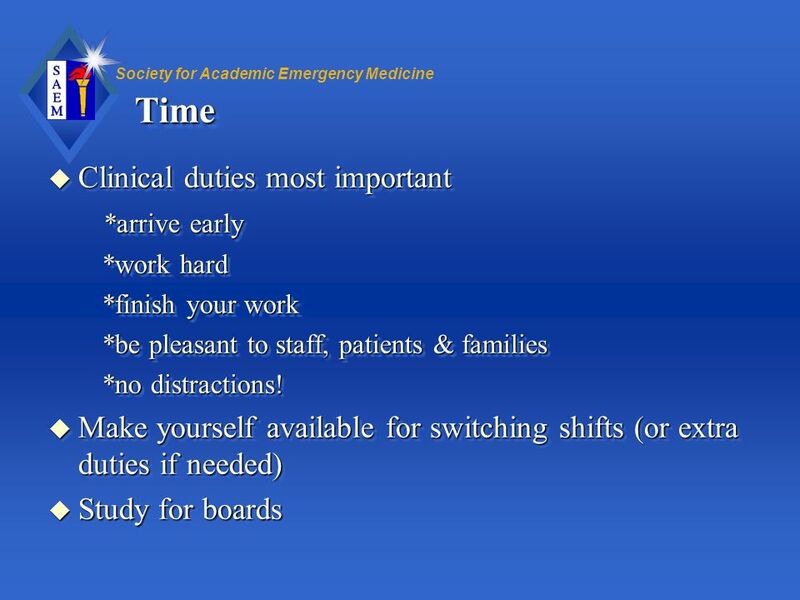 *work hard *finish your work *be pleasant to staff, patients & families *no distractions! 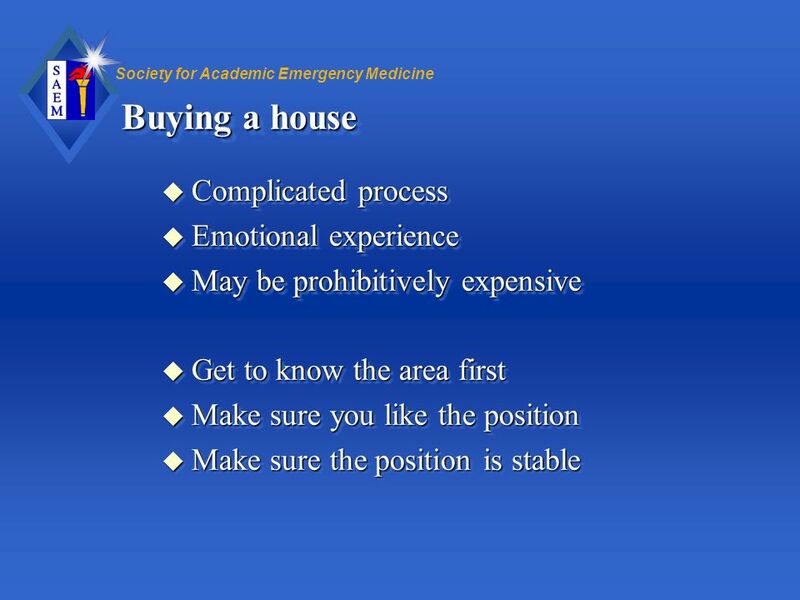 Make yourself available for switching shifts (or extra duties if needed) Study for boards Distractions - airline tickets, vacation plans, personal phone calls Don’t buy a house while you are starting - color carpets/cabinets, catastrophes, etc. 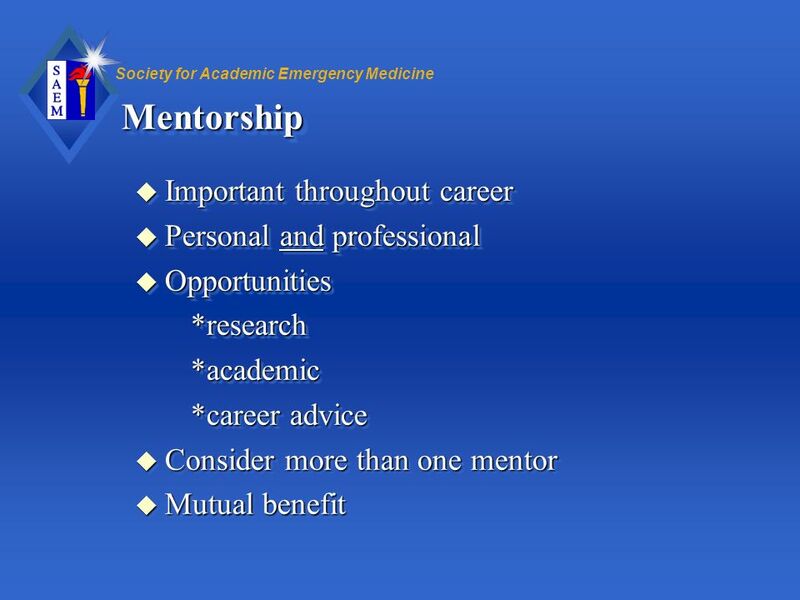 Opportunities *research *academic *career advice Consider more than one mentor Mutual benefit Article in Annals EM August 99. 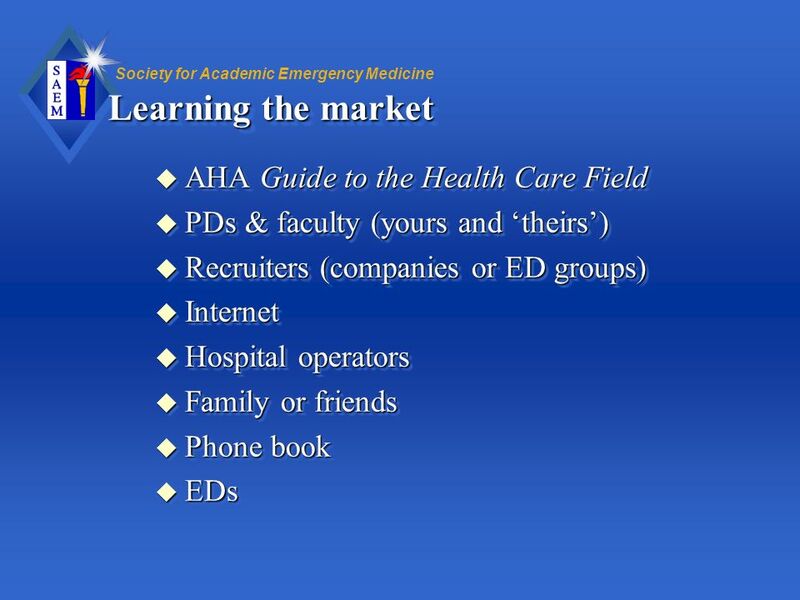 Reference, mention, read it! 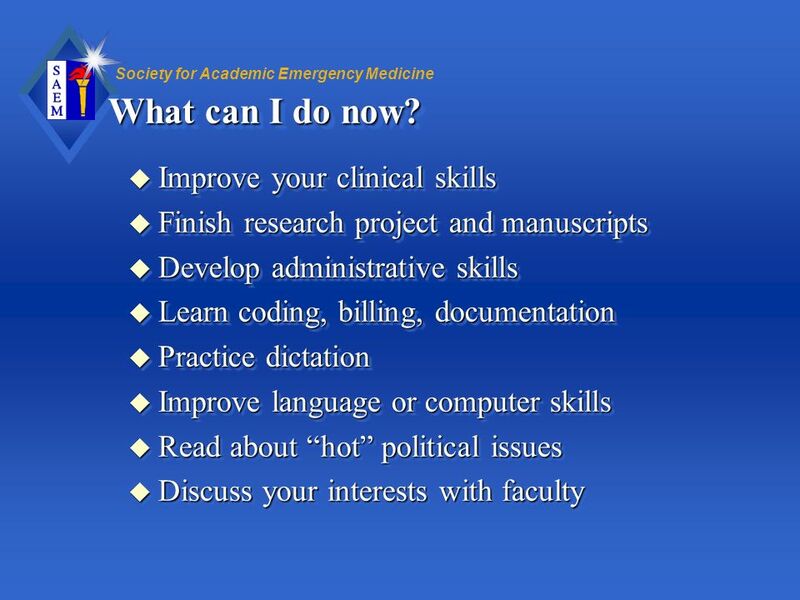 Opportunities: projects, committees, book chapters, research assistance, etc. 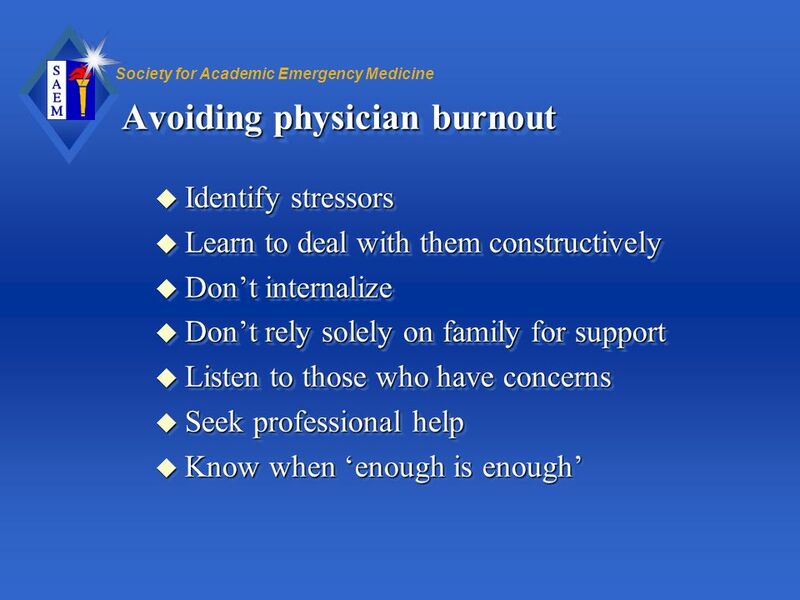 Identify stressors Learn to deal with them constructively Don’t internalize Don’t rely solely on family for support Listen to those who have concerns Seek professional help Know when ‘enough is enough’ Mention ACEP text. 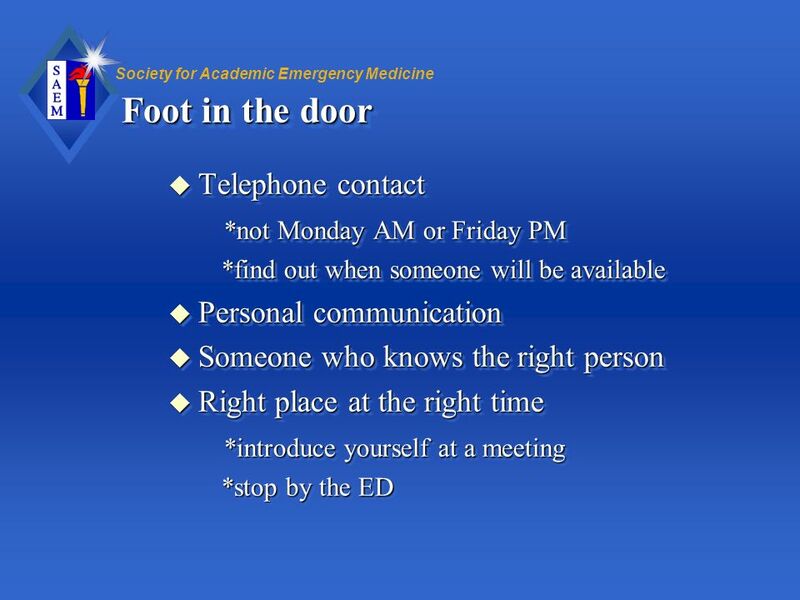 Compassion Community Get yourself on some committees, which is a great way to meet people and to make yourself indispensable (in other words, important to the hospital and to the group). 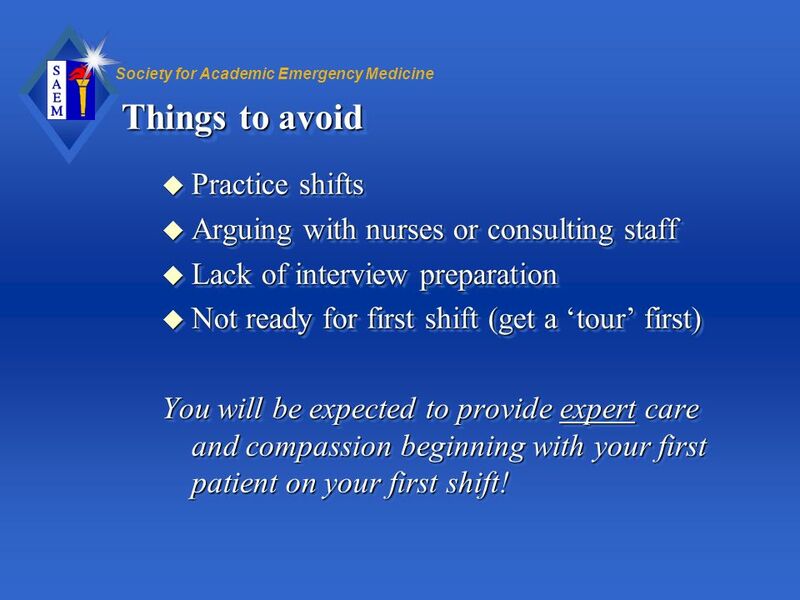 Don’t let it interfere with your clinical duties, however. 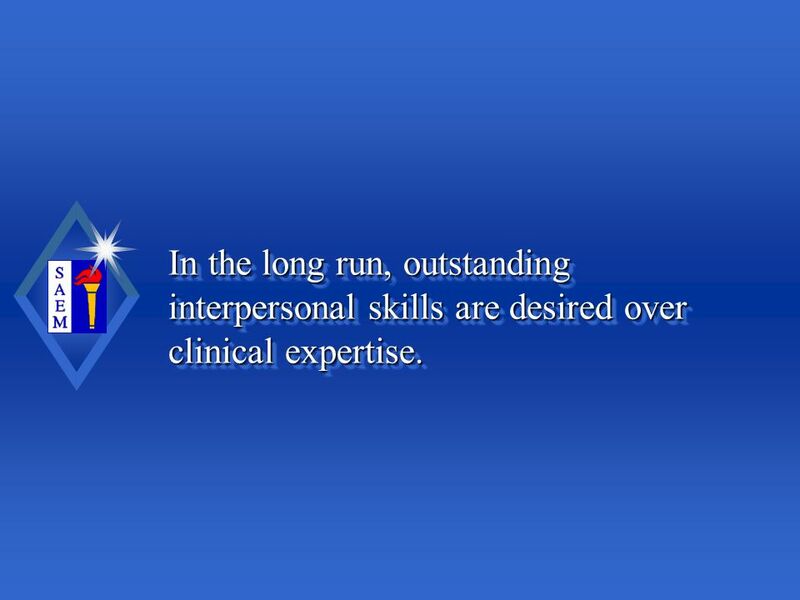 65 In the long run, outstanding interpersonal skills are desired over clinical expertise. 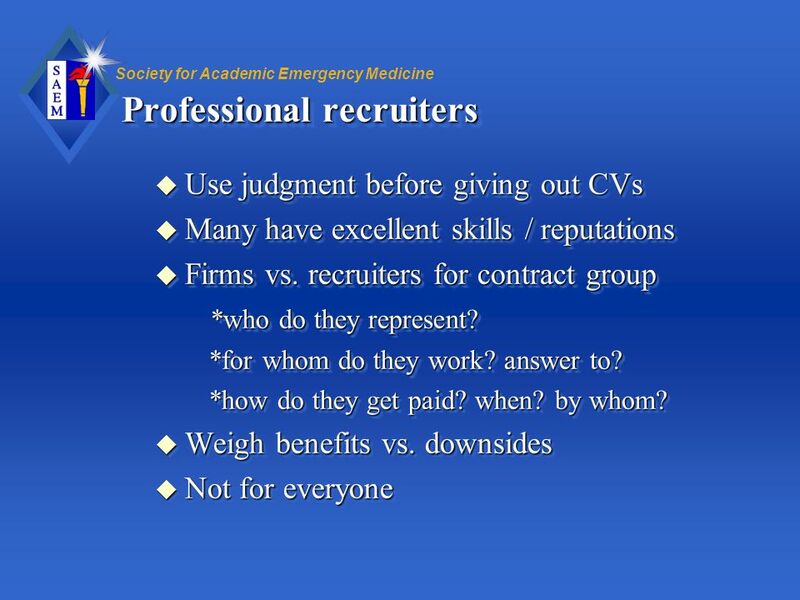 Medical -legal literature supports this (numbers of lawsuits are greater if physician is not “liked”). You will be expected to know that a pregnant female with lower abdominal pain is an ectopic pregnancy until proven otherwise. 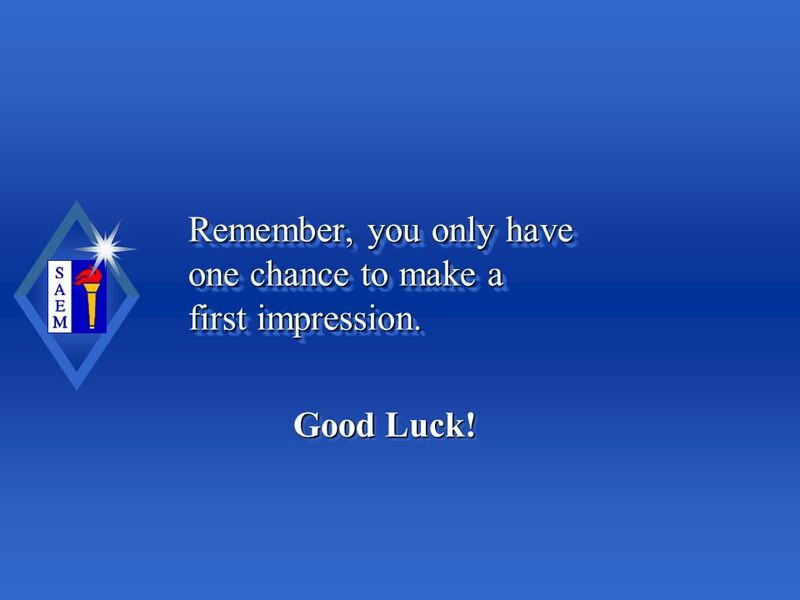 66 Remember, you only have one chance to make a first impression. 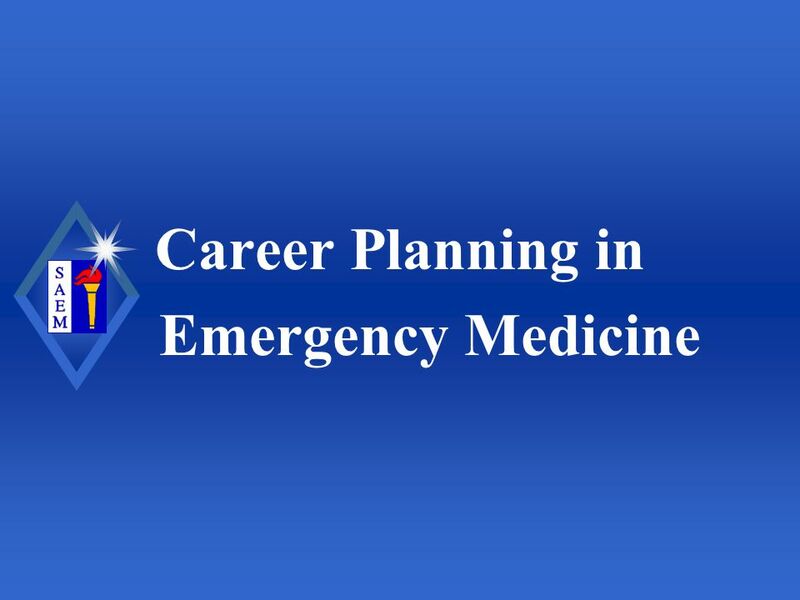 Download ppt "Career Planning in Emergency Medicine"
Internships Your Key to A Career Opportunity. 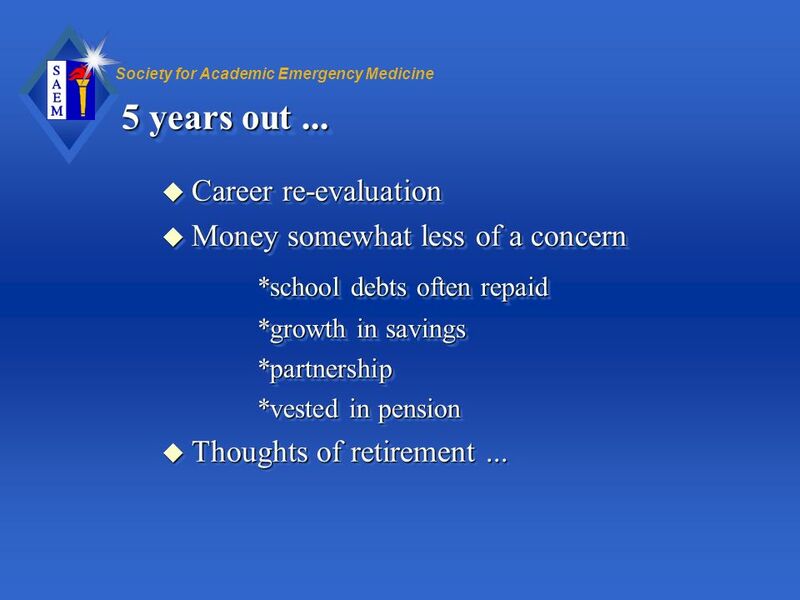 Benefits Practical Experience Compensation Teamwork Experience Technology Exposure Helps With Career Decisions. 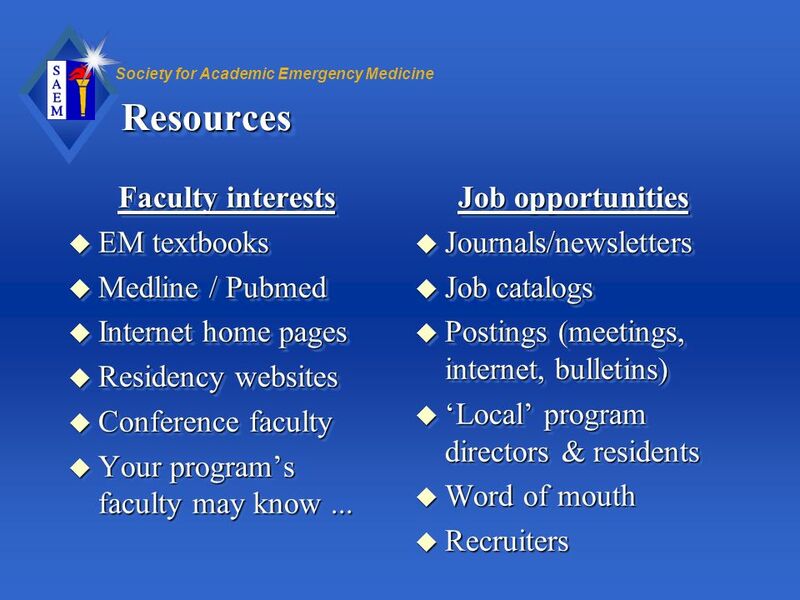 FELLOWSHIPS & EM ORGANIZATIONS. 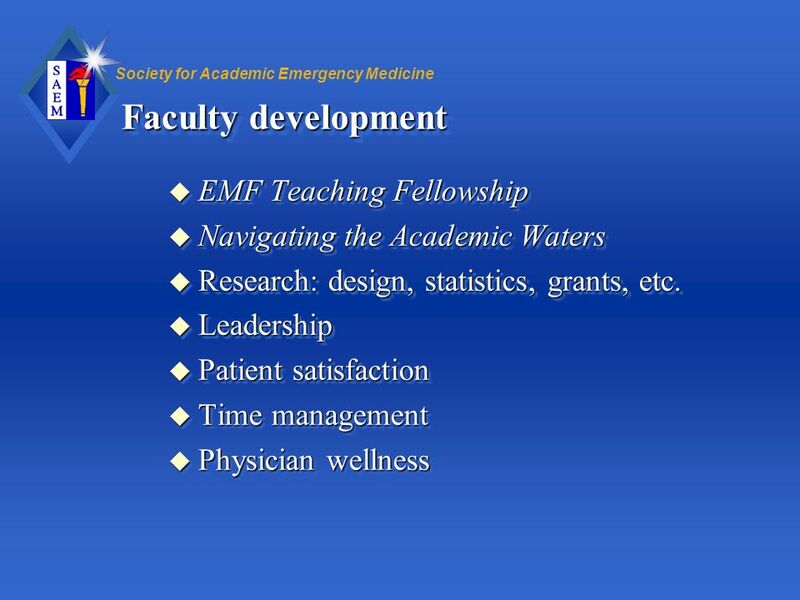 Why a Fellowship u Increase knowledge base u Increase marketability u Establish expertise u Build framework for national. 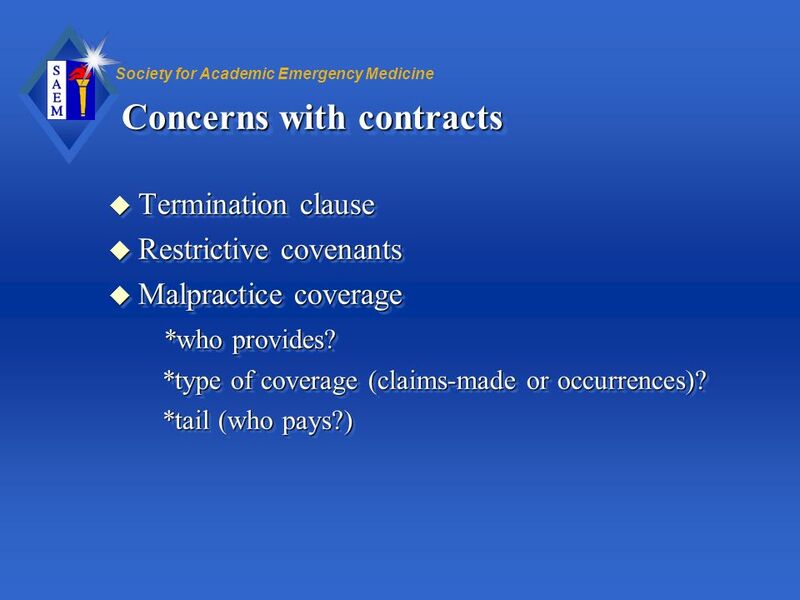 Contracts for Emergency Physicians. 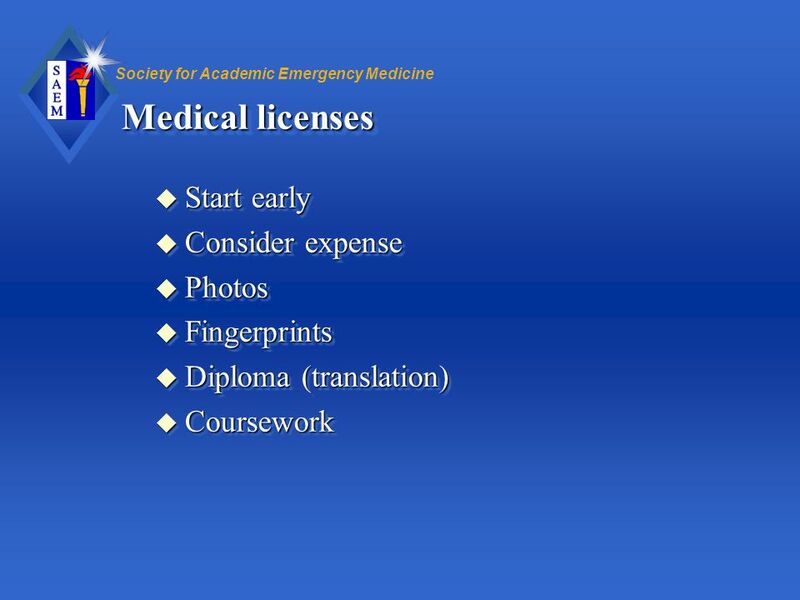 Society for Academic Emergency Medicine Objectives u Provide a general overview of employment contracts and their. 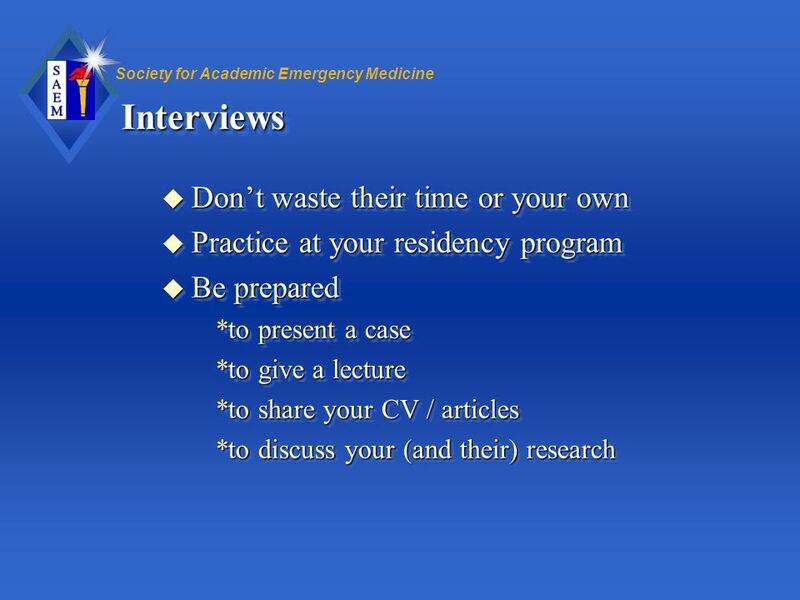 Careers in Academic Emergency Medicine. 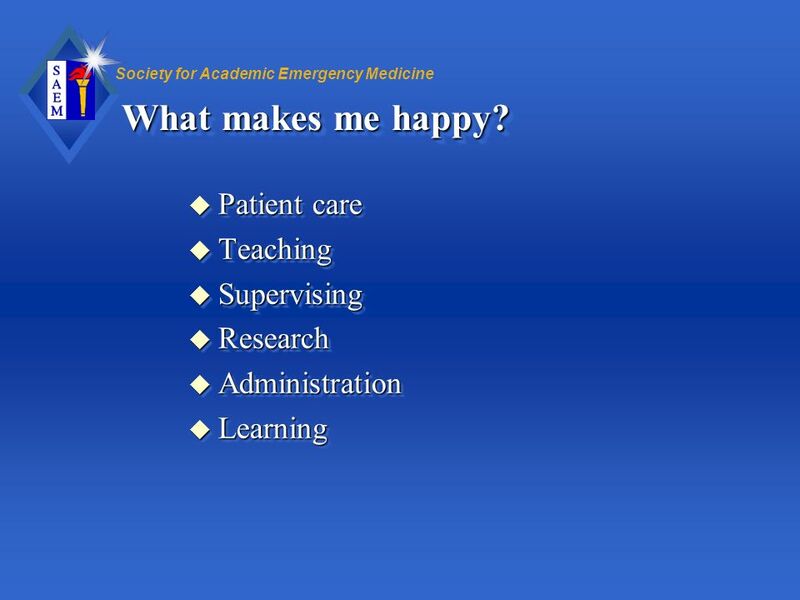 Society for Academic Emergency Medicine Overview u Why academics? 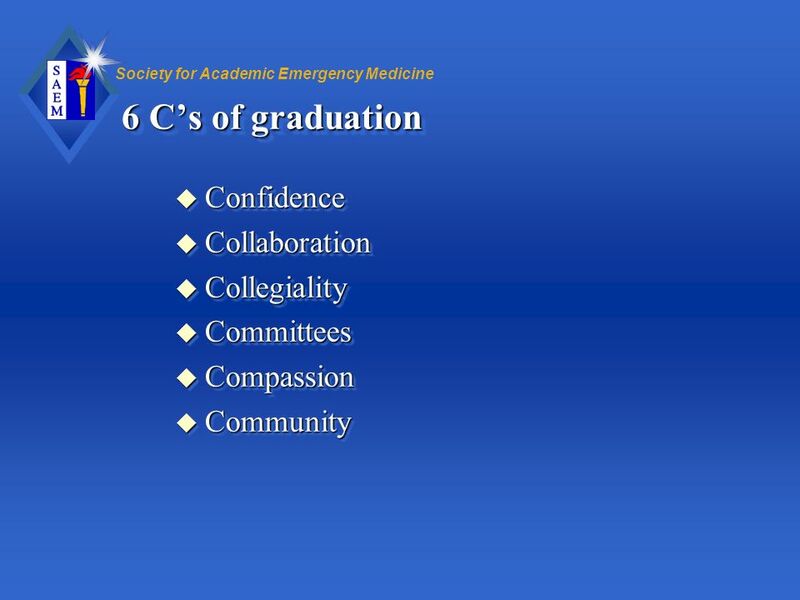 u Various settings u How to prepare u Fellowship. 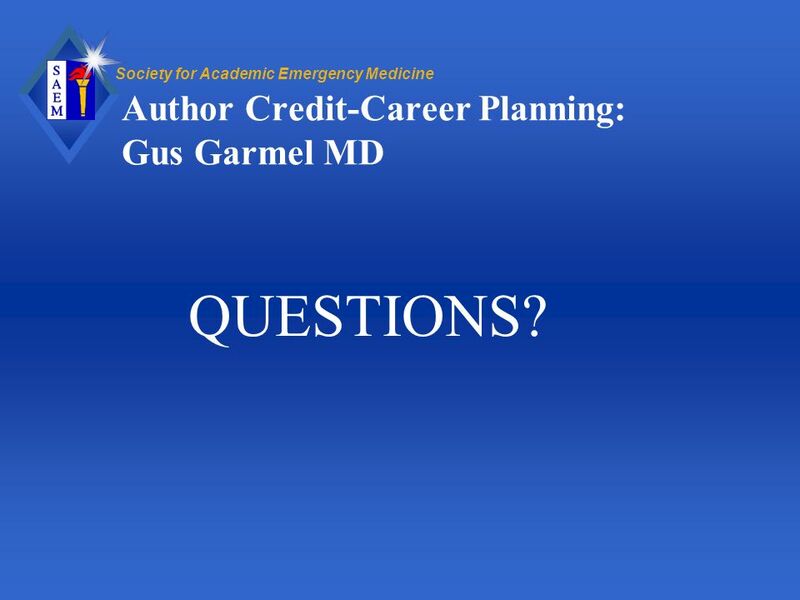 Graduation Action Plan: 11th Grade Career/College Planning Unit Module Five: The World of Work. OH 3-1 Finding and Recruiting New Employees Human Resources Management and Supervision 3 OH 3-1. March to Employment Success … … Time to Grab your Horn and make some noise! 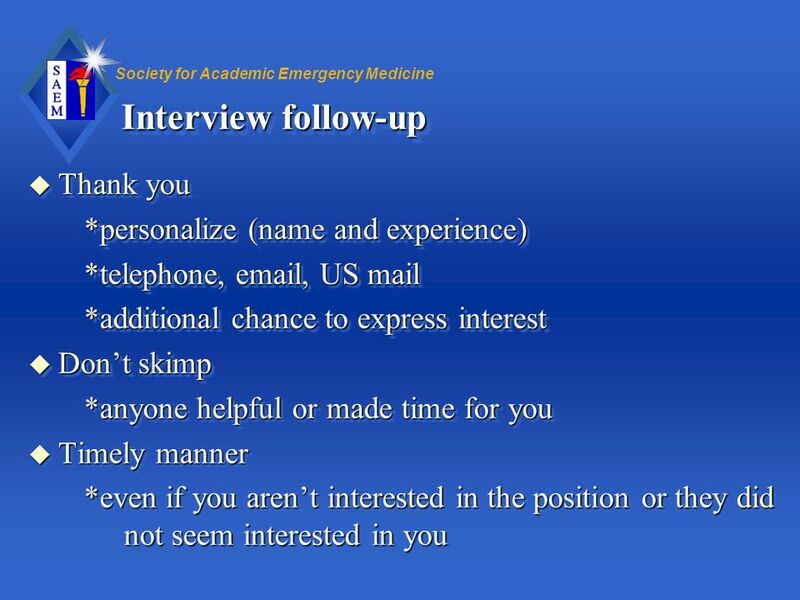 Topic: Interviewing The information and presentation that follows was originally. 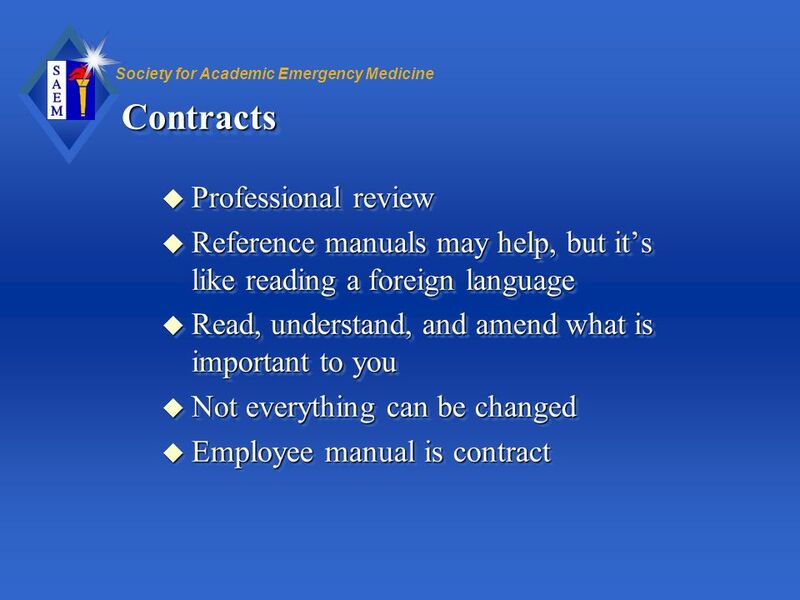 1 © 2000 American College of Radiology Physicians Employment Contracts How to Survive Your First Contract Thomas R. Hoffman Associate General Counsel American. 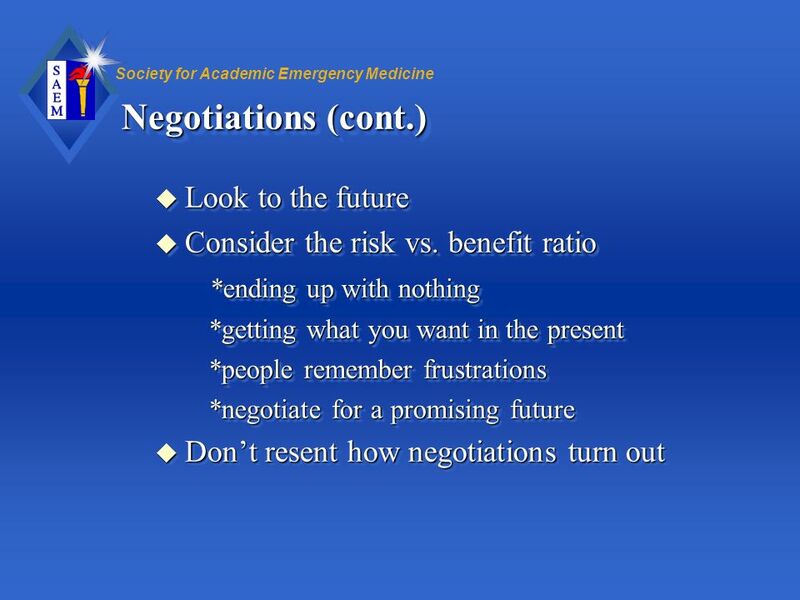 Salary Negotiation. 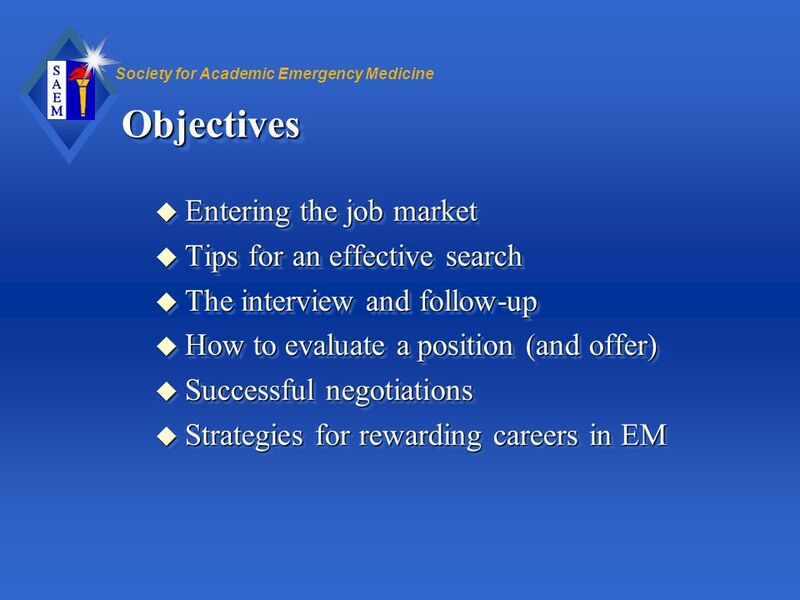 AGENDA Goal of Salary Negotiation Preparation Calculating Your Worth The Offer Counter Offers Conclusion/Q&A. Pennsylvania Association of School Business Officials Smart Business + Informed Decisions = Great Schools CAREER DAY 1 Careers in School Business Management. 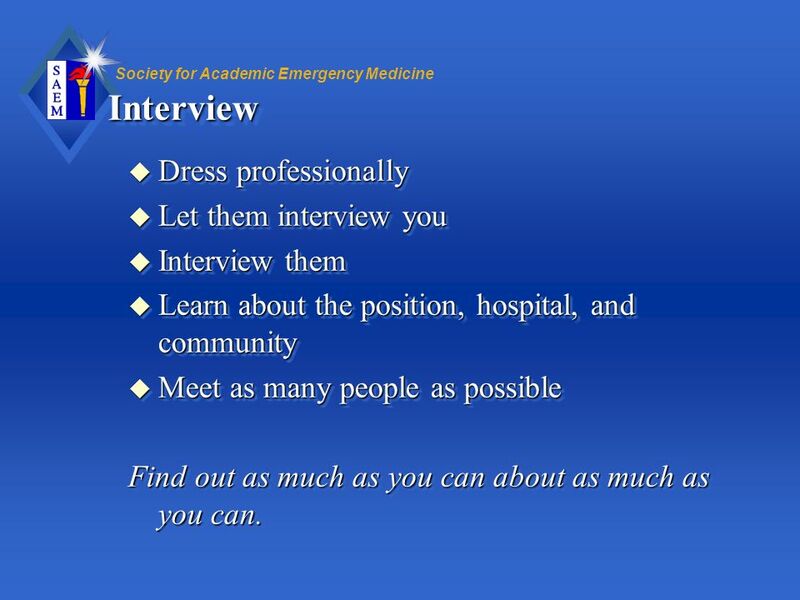 Interviewing Presented by Clark University Career Services. ADVISOR MANAGEMENT 101: HOW TO BEST WORK WITH YOUR RSO ADVISOR A FRATERNAL LEADERSHIP SERIES & RSO WORKSHOP WEDNESDAY PROGRAM. 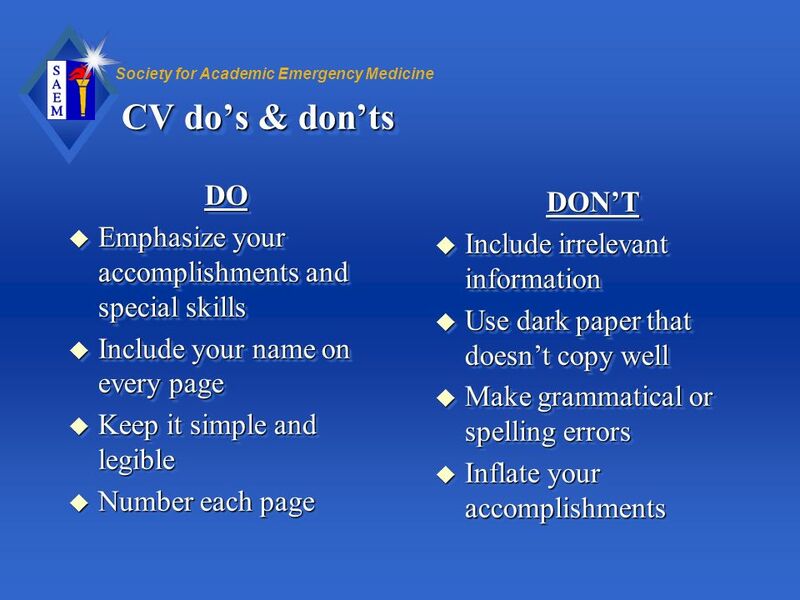 Prepare for the Fair How to Make a Career Fair Work for You 1 Presented by Clark University Career Services. 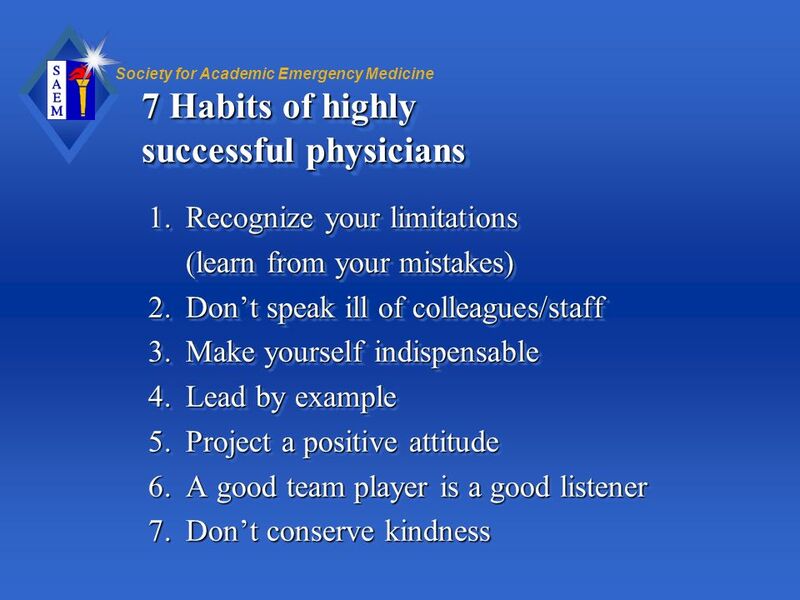 Jerry N. Harrison New Mexico Health Resources. 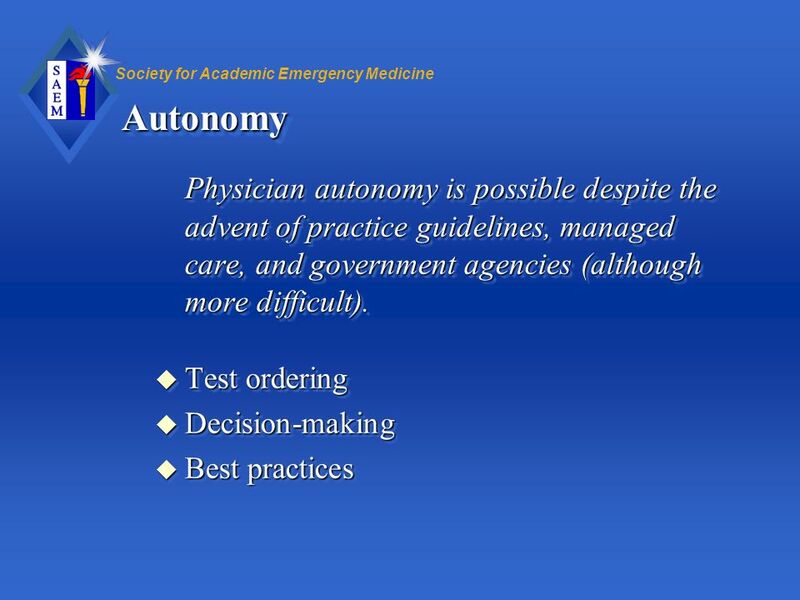  State and federal laws hold Clinic Boards of Directors legally responsible for the control and operation.